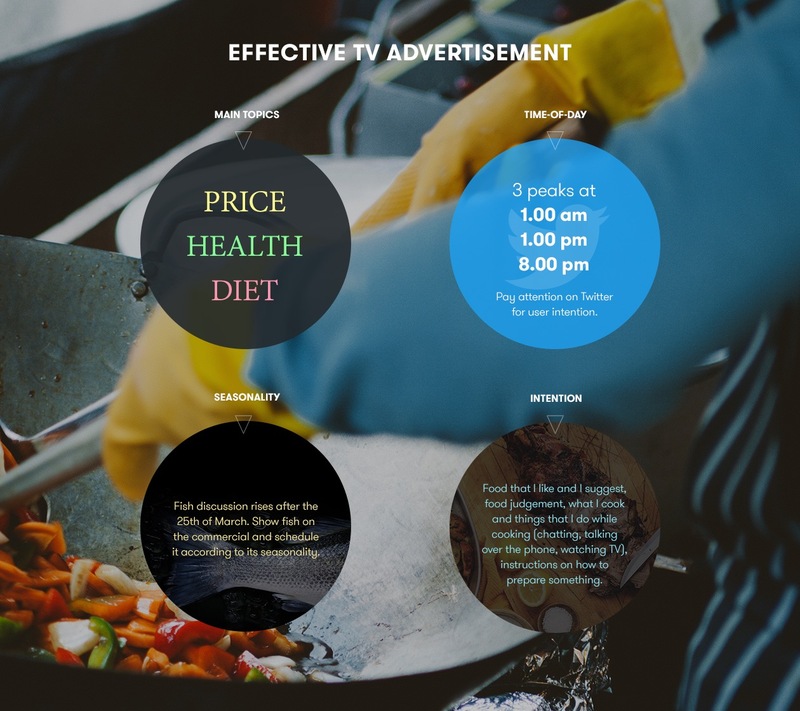 Hellmann's wanted to create a TV commercial that was based on nutrition data collection and analysis. The company also wanted to identify user intents about food and nutrition on Twitter. This was a multi-faceted project and in order to solve it we applied a series of natural language processing algorithms, such as: Term extraction and clustering into topics that play an important role in the discussion around food; Search for specific types of food; Temporal analysis for the detection of time-of-day and seasonality of food discussions; Intention analysis that applies sentiment analysis and intention verbs in order to find patterns in the data that indicate intention. Main topics: price, health, diet. These are the messages of the commercial. Time-of-day: 3 peaks at 1.00 am, 1.00 pm, 8.00 pm. Pay attention on Twitter for user intention. Seasonality: discussion about fish escalates after the 25th of March. Show fish on the commercial and schedule it according to its seasonality. Intention: food that I like and I suggest, food judgement, what I cook and things that I do while cooking (chatting, talking over the phone, watching TV), instructions on how to prepare something.